Born in India in 1939, she has lived in Co. Kerry since 1947. She studied at the National College of Art in Dublin, Le Centre de Peinture in Bruxelles and the Bath Academy of Art in Corsham. 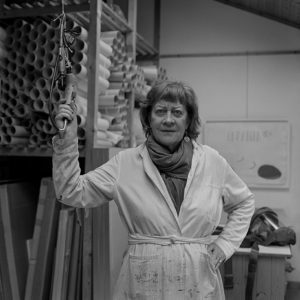 Since the 1970s she has principally worked with plaster and fresco pigment to create highly schematic works which reference man’s relationship with the land. She has exhibited work regularly at the Royal Hibernian Academy Dublin.Solo exhibitions include the Betty Parsons Gallery, New York (1978, 1982) Crawford Municipal Art Gallery, Cork (1985); Taylor Galleries, Dublin (1980, 85, 87, 98, 04) the Royal Academy of Arts, London (1995, 2000); the Graphic Studio Gallery, Dublin (2000) and the Taylor Galleries, Dublin (2004). Group exhibitions include: Stoney Road Press (2007) Writers Week Listowel (2007) Irish Art and the Old Testament, The Chester Beatty Library, Dublin (2002) and The West as Metaphor, The RHA, Dublin (2005). Current works in plaster and on brushed steel are on display at the Irish Museum of Modern Art (until March 2008) as part of the Three exhibition which presents three artists (Simonds-Gooding, Charles Brady and Callum Innes) in solo displays. Her work is held in many public collections, including the Irish Museum of Modern Art, Dublin; Department of Foreign Affairs, Dublin; Albuquerque Museum, New Mexico; Hirshorn Museum, Washington, D.C.; Israel Museum, Jerusalem; National Gallery of Modern Art, New Delhi; Saatchi Collection, London; and the Metropolitan Museum of Art, New York.